It’s one of what I refer to as a vessel’s “mother” systems, key components without which the vessel cannot operate. These include propulsion, steering, and raw water plumbing integrity. While other systems are important, including electrical, sanitation, and potable water, the mother systems are essential. The prudent mariner, therefore, should make every effort to see that these systems are well maintained and in good working order at all times. Steering systems are one of the many components I review during the vessel inspections I conduct. I look carefully at a number of items beginning with the design and then progress to the execution and current state of maintenance for systems that have been in service for some period of time. Chief among the criteria I use to evaluate a system is access. I recently inspected a large twin-screw motoryacht whose lazarette had been converted into crew’s quarters. In the process, access to the “tiller flats” area, the term used by some in the industry to identify the area where steering gear resides, was all but eliminated. Ultimately, after disassembling joiner work, some degree of access was afforded, however, only to the starboard side. That’s simply unacceptable. No critical system aboard a vessel should be made inaccessible, and if any modifications are carried out they should be to improve, rather than effectively impede access. Ready access is important for two reasons. First, without it, regular, casual, and formal inspections simply can’t take place. Whenever I’m in a “tiller flats” area, I’m conducting an informal inspection of the system. I’m looking for loose hardware, signs of fretting and spalling, fluid leaks, loose or poorly aligned cables, etc. As a vessel owner, you should adopt a similar approach each time you are in this area—carry out a one-minute casual inspection. If access is impeded, however, than this is a difficult practice to adopt. Steering gear should be thoroughly andformally inspected at least quarterly for vessels in full-time use and seasonally for vessels that are used only periodically. The second reason that ready access is a prerequisite for any steering system involves emergency repairs. When a steering system fails, every minute is critical and each minute that passes without steering could be bringing a vessel closer to a rock jetty, a concrete pier, another vessel or foundering in high seas. If you have to spend more than 60 seconds getting to all of your steering components, rudder shaft, tiller arm, ram, cables and sheaves, your system lacks adequate access. Details regarding steering system design for recreational vessels could easily fill a chapter of a marine systems book (and will in the one I’m writing). In the space available here, I’ll touch on key aspects. The loads placed on a steering system are often significant, many thousands of pounds, particularly while operating in confused or following seas. Therefore, the system needs to be designed with a safety factor that precludes the possibility of failure if it should be overloaded under the most extreme conditions the vessel may ever be expected to encounter. Common failures of this protocol involve the manner in which driving mechanisms such as hydraulic rams and cable sheaves are attached to the vessel. Fasteners must be properly sized and torqued, and the shelves or supports to which they are attached must be exceptionally robust and fully capable of accepting tens of thousands of cyclical, reversing loads (cyclical loads are among the most challenging with which to contend, and are the cause of the vast majority of equipment failures aboard). The orientation of hydraulic rams in relation to the tiller arm, the appendage that is interspersed between the ram and rudder stock, is yet another area where designs come up short. Counter-intuitively, in order for it to exert the maximum driving force when it’s needed most, the ram should not be perpendicular to the tiller arm when the rudder is amidships. Instead, the tiller arm and ram should be at right angles when the rudder is hard over in either direction. Rams that are properly installed, with this orientation, are by far the exception. While the defect is not one that has catastrophic consequences, it’s indicative of the designer’s or installer’s understanding of the system and their ability to follow the recommendations of the steering system’s manufacturer. Rudder stop design is yet another area where there is a frequent lack of understanding and compliance with manufacturer guidelines. Where the majority of hydraulic steering systems are installed, manufacturers call for the ram to expend all travel prior to making contact with the stop. If you hydraulic steering system’s tiller arm bumps into the stop when the rudder is placed had over, the design is very likely flawed. The reason for installing stops on such a system (they are optional), is to stop the rudder from traveling too far, into the propeller in some cases, in the event of a component failure. 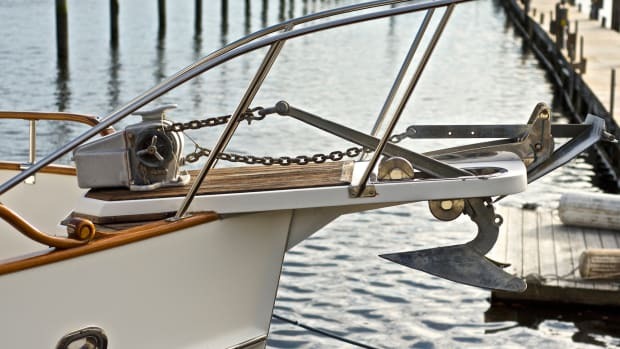 In the case of cable over sheave systems, the opposite is true—the rudder’s tiller arm should make contact with the stops when the wheel is placed hard over to port or starboard. Like the rest of the system, stops must be robust and capable of supporting significant loads, should some part of the steering system fail. In the event of a steering system failure, your vessel should include some contingency for emergency steering. Twin-engine vessels can often be steered, albeit imperfectly, using varying propeller thrust. If you’ve never tried this give it a go, it’s probably more difficult than you would think. In many cases, however, vessels are equipped with emergency tillers. During vessel inspections, I frequently fit and test emergency tillers, often with surprising results. In many cases, the tiller socket fails to engage the rudder stock because one is too small, the other is too large, or the tiller socket is corroded (some are made of mild steel and rust during years of storage in damp lazarettes). In other cases, the tiller is awkward, offers inadequate leverage or swing room, or remarkably, it must be operated from the swim platform. In other cases the emergency tiller engages the rudder stock. However, unless the hydraulic ram is physically separated from the tiller arm, or tie rods in the case of twin screw vessels, the rudder cannot be moved. Hydraulic systems prevent rudder “feedback,” which makes it impossible to back pressure the ram with an emergency tiller. I’ve queried boatbuilders, whose vessels require this approach, asking what a user should do in the event the emergency tiller is needed. “Just remove the nut and bolt” is the most common response, or disconcertingly, “What do you mean?” which would indicate the system has never been tested. I’ve experienced steering failures in a seaway and it’s unnerving at best. The last thing I want to do in such a case, is climb into the tiller flats with a wrench and socket to separate a large nut and bolt in order to be able to use the emergency tiller, and I may be doing so while significant loads are being placed on the rudder by wave action. Once separated, if the system does not include stops, the action of seas or backing down could turn the rudder around and into the hull (where it may jam), or into the propeller. I do not want to take the time to do this. I’d like to be able to engage my emergency steering gear within no more than three minutes. An alternative to the “simply remove the bolt” approach is truly simple, safe, and quick; install a hydraulic crossover valve that allows fluid to travel from one side of the ram to the other. With this approach, using the emergency tiller only requires its installation and the flick of a valve. The ram not only continues to act as a stop, it also dampens movement. It’s worth noting that this, and all manual hydraulic steering and autopilot isolation valves and plumbing fittings, must be rated for 1000psi applications. Valves should be clearly embossed with “1000 WOG.” (WOG stands for water, oil, and gas). If you have no emergency steering system plan in place, create one. Once you have installed it, or if you already have one, test it to make sure you can engage it quickly and make sure it works.